Once again, my wife has come to the Gazette, empty plate in her hands, to give us the lowdown on another vegetarian dish. While this entry may sound anything but vegetarian, I promise you this review is on the up and up. Hello Main Street Gazette readers! Today I am back with a truly amazing vegetarian entrée. I know many of you have been to Animal Kingdom Lodge and have likely also been to the award winning Jiko, but have any of you taken the time to try the vegetarian options they have on the menu? Today, we are going to explore the uniquely named Bunny Chow! In reality, this menu item is actually called "Bunny Chow" and "Falafel" Durban Curry Vegetables, but ordering something with the name Bunny Chow greatly amused my dining companions and intrigued me enough to ignore all of the other amazing items on the menu. As you can see from the photo, this dish was separated into two parts, the Bunny Chow and the Falafel, making for an amazing sampling of African and Indian inspired flavors. So, what is Bunny Chow? Well, according to Wikipedia, “it is is a South African fast food dish consisting of a hollowed out loaf of bread filled with curry, that originated in the Durban Indian community. Bunny chow is also called a kota in many parts of South Africa.” It apparently originated in the 1940s and is commonly served with a grated carrot, chili and onion salad. This portion of the entrée used Naan bread for the hollowed out loaf and was filled with a spicy mix of curried vegetables. I would compare this to an empanada in texture and flavor. It was quite crispy on the outside with softened bread and vegetables on the inside. Underneath the bunny chow, was the traditional carrot, chili and onion salad that was crisp and perfectly cooked. The one thing that surprised me about this side of the plate was the mixture of spicy and sweet. Having both the harissa mustard and mango ketchup gave a blending of flavors that I was extremely happy with. Now, let’s move on to the falafel. This was a different version of a falafel than you can get at the Morocco Pavilion in Epcot or at any Mediterranean restaurant in your home town. 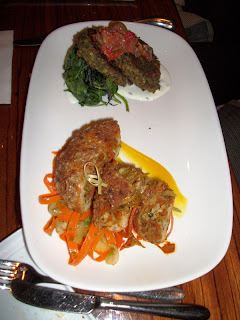 This was, as the specific description on the menu says, “a chickpea-lentil cake,” or actually 2 chickpea-lentil cakes over wilted greens with cilantro yogurt and peppadew-olive tapenade. The cakes themselves were not deep fried, like most falafels, but were instead pan fried, leaving a crispy top and bottom but softness around the edges. Also, these cakes had a course texture due to the mix of lentils, chickpeas and other vegetables, which included carrots and onions. Because of the course texture of the cakes, the wilted greens were a great accompaniment. This portion of the plate was also a little spicy due to the peppadew-olive tapenade, so the cilantro yogurt was wonderfully cooling to the palate. Overall, this was an amazing dish. I was blown away by the combination of flavors and textures. Often when you order a vegetarian entree, it ends up being some form of pasta or vegetable plate, but at Jiko, the chef truly took the time to lend both tradition and creativity to the dish and I encourage everyone to try it.